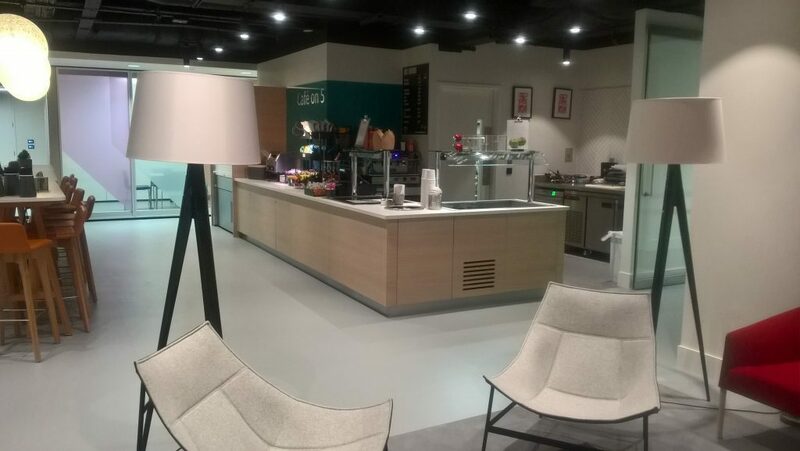 A Fancy New Cafe Design & Install For Charles Stanley & Co.
Charles Stanley & Co. Limited is one of the oldest firms on the London Stock Exchange and recently have consolidated their offices to a new refurbished office on Bishopsgate, London. 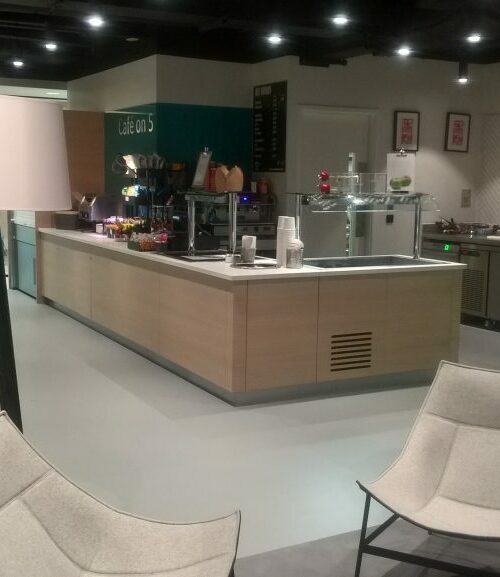 Working with the facilities team and the Caterer on site, we designed a new cafe bar operation with kitchen, supported the refurbishment of the basement catering area, self-service credenza and hospitality pantry. 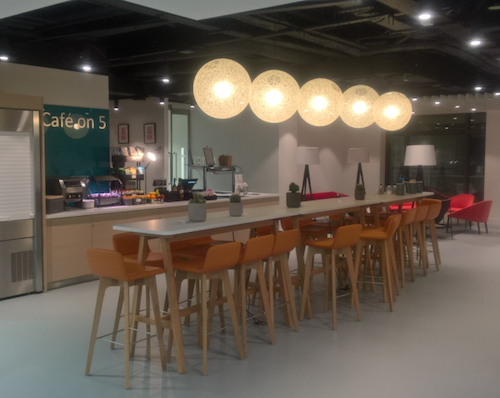 The L-shaped café comprises of both hot & chilled display units, soup and a chilled multi-tier retail unit. Coffee machine area with associated refrigeration and back bar to support the overall offer, which houses a double door under counter refrigerator and heavy duty specific dishwasher. All the front facing fascias have been finished in light oak veneer and stainless steel at the rear. The cafe kitchen space is limited, however, we have provided the team with a compact combination oven, 4 burner electric range and double deep fat fryer. The ventilation canopy with fire suppression was also a part of our scope of works. 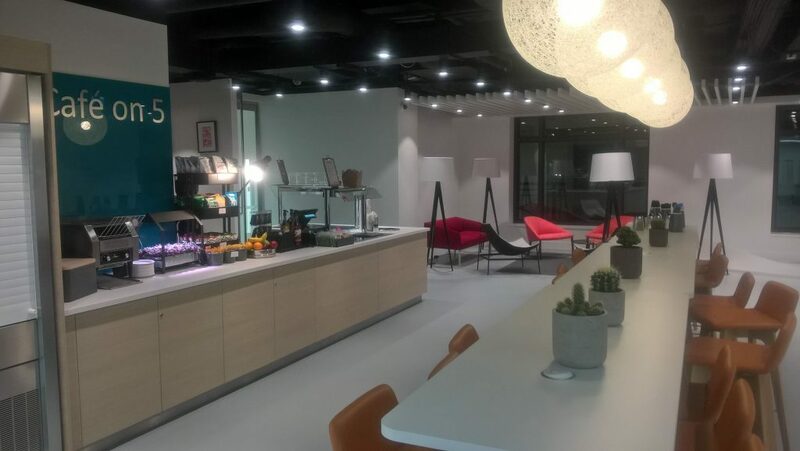 The cafe allows for employees to make their own meals and drinks, to allow for this we installed an eight metre long credenza unit in the main cafe ‘breakout area’ with storage in mounted units, floor cupboards and drawers. The area contains built in microwaves, under counter refrigeration, a water fountain and washing facilities. To continue the theme, all front facing fascias have been finished in light oak veneer. In addition to the above, we were asked to supply the front of house wall finishes, we selected Herringbone tiling to the rear of the café back bar and back painted glass panels to credenza units. Charles Stanley inherited a catering facility located in the basement of the property with old food preparation tabling and walk-in cold-rooms. To improve the area we stripped out all the old floor, ceiling tiles and equipment and replaced with new fit for purpose finishes and stainless steel tabling. During the fit out, we arranged for the cold rooms to be serviced and commissioned. An existing hospitality pantry was equipped with new bulk brewing equipment, refrigeration and a mobile hot cupboard. 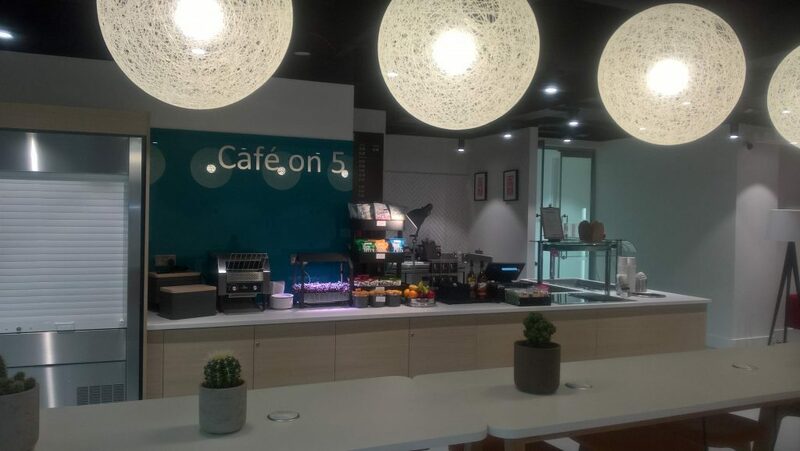 For the project we worked with a number of great suppliers to ensure full operation of the cafe!